This guacamole met with rave reviews. It was consumed within minutes by my brothers and my dad. Cut avocados in half. Stick a knife in the seed and give it a twist to loosen seed. Pull out the seed using the knife. Use a spoon to scoop out the avocado flesh. 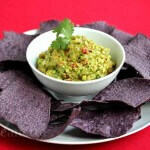 Place avocado and lime juice in a mortar and pestle and mash until smooth. Add salt, cumin and cayenne and mash until well combined with avocado. Add onions and mix to combine. Add tomatoes, cilantro and garlic, and mix well.